A short while ago I was reading one of my favorite blogs by one of our newly local bloggers and I came across this post. I'll admit I especially enjoy Calah's posts about Naples, because I can sit here and relate to everything she says about the Snowbird craziness of this town. 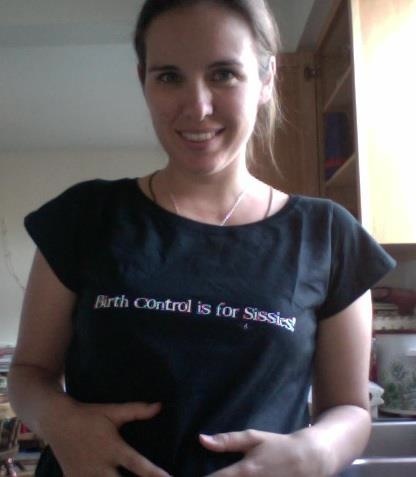 So after reading the post I really, really wanted my very own birth control post. Maybe it's just my culturally rebellious nature, but in the current political climate, with all the fashionable liberal Catholic bashing that's gone on, owning this shirt was particularly appealing. And I thought it would be lovely to wear it with a rapidly growing baby bump. The shirt is in this shop (since I've already been asked) at Cafe Press and if you put in the coupon code MARCH30 you get an extra 30% off. I'm a huge fan of the fit of the maternity shirt (and when it comes to maternity shirts I can be pretty picky). I have a feeling this shirt may inspire some interesting stories... but... it's already one of my favorites! Serious props for wearing that in public! I am 100 percent Catholic, pro-life, the works, but I could never wear that in public...I'd be wayyyy too embarassed. And I'm super non-confrontational. But props to you :) And congrats on the new baby!!!! LOVE the tee.... although I'd say you'd have to be a thick skinned person to wear that in public in case you got some comments.... I am not that that thick skinned... hehe. I love it ;) Go Cammie! Ahh, haha I love it! I don't know if I'd have the guts to wear it out of the house, so props to you!